For a completely different, and completely free, walk in the woods try the Andres Institute of Art in Brookline, NH. Located on Rt. 13, it is 140 acres of woodland dotted with modern art and gardens. Even if modern art is not your “thing” you will find this a delightful outdoor adventure, sparking conversation with your children or walking companions about art and nature, or about the nature of art. Each piece of art is carefully placed amongst trees, gardens or boulders. The founder Paul Andres is an engineer, and the director John Weidman is a sculptor. Each fall the Sculpture Symposium brings visitors and artists together with guided walks and workshops, and places new work in the landscape. It is the largest sculpture garden in New England. The Andres Institute is non profit, and is seeking volunteers and service organizations to help maintain the trails and lead tours. The grounds are open every day, free of charge from dawn to dusk. Maps are located at the beginning of the trail, at the parking lot. Printable trail maps are available at the andres institute of art website. 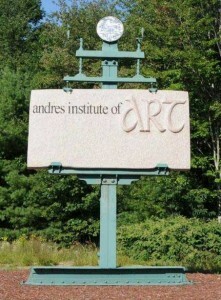 Look for the entrance to the Andres Institute of Art on the west side of Rt. 13, just south of Big Bear Lodge, in Brookline, NH 603-673-8411 info(at)andresinstitute.org.